Who is the newsman in question? How did he know about the “widow”? What is the name of her town? Why did she wait until his appearance before divulging the existence of the car in the barn? Which farm machinery company are we talking about? In which year did this take place? Where to in New Jersey were the farm implements delivered? The German government did not claim ownership of any other “Fuhrer”-vehicles. It would not have claimed this one either. In addition: if the car had been repainted, as claimed in “the only changes”, how come no one can provide any pictures of the car, in any setting? Additionally, I dare say that a journalist would not have hidden the car once in the USA, but tried to make a bundle by displaying the car. And finally, how come no one knows where the car is nowadays? In the same spirit, the 1/43 scale model made by ABC Brianza of Italy, and described by me in a recent issue of the MBMC-JOURNALJ, is a fantasy model as well! This month’s special Mercedes-Benz deals rather with a fantasia-filled legend of notoriety than a factually-based object of technical prowess. This piece of advertising was recently purchased on the Ebay auction site. It purports to be a colourful sales promotion piece for the “Most Valuable Car in the World”. 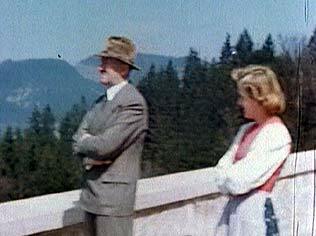 It dates from 1975 and veritably overflows with superlatives about this “special” car and its notorious owner, Eva Braun, Adolf Hitler’s shy mistress and later wife. Unfortunately, the layman may easily be convinced of the “authenticity” of the claims made in the promotional piece. However, anyone with an inkling of historical perspective and having any knowledge of technical capabilities will certainly see the crass exaggeration exuded by this fanciful article. This particular vehicle has no factual basis in any literature, nor in the official archives of Daimler Chrysler AG. Hucksters of unknown origin have created a fantasy car, which when studied, borders on the ridiculous, given the claims made. The notoriety of the Nazi regime continuously spawns legendary stories, most of which are embellished or totally devoid of truth. Read this story and draw your own conclusions (hearty outbreaks of laughter are allowed, and, indeed, encouraged!). This 1938 Mercedes-Benz is the most valuable car in the world. It is alleged that the Chancellor Germany ordered it to be the personal car for Eva Braun. The history is also legendary, engineering and construction are fact. The chassis and motor were hand crafted in Stuttgart, Germany and the body hand crafted in Switzerland. The motor is supercharged straight eight. 400 Hp. The cruising speed 170 Mph and it has been driven at 175 Mph. It has 2 transmissions, both with over drive, 2 sets gears and may be driven with 4 or 7 speeds. The first transmission takes’ it to 125 Mph using first set of gears then converts to the second transmission to reach 175 Mph. This automobile has both fuel injectors and spark plugs. The gas tank is under the hood. .. The diesel tank is the rear of the car and it may be driven with either fuel. The lever on the steering wheel converts it from gas to diesel. There is also a lever on the steering column that lifts the body away from the chassis for a more even ride, it is claimed that the British Jaguar was copied exactly from this car in 1940. The wheels are of special interest . . . each wheel individually suspended and each wheel is equipped with 7 automatic balancers. The tires have been replaced, they are exact replicas of the originals “17 inch, 7 ply. The only changes made on the car are the paint and the radiator cap. Original color was black and silver. The original radiator cap-hood ornament was stolen and has been replaced. The ornament on the new cap originally decorated a Nazi flag staff. The gold trim you see on the automobile is 22 carat gold. The metal curtains in front of the radiator slide up so as to keep the cold out and allow engine to heat faster. The automobile weighs 7,500 lbs., almost as much as a Cadillac. The body is made of 10 gauge steel and is built in 1 piece with no seams. There are only 4 removable parts. .2 doors, the trunk and the hood. An American newsman, looking for a story interviewed his widow and was amazed to discover it she was in possession of this automobile. He managed to buy the car from her with the understanding that he would remove it from Germany without involving her. He contacted the president of a farm machinery company in Germany and gave him $5,000 in U.S. currency to arrange with his company to crate and ship and label this car as a farm combine and the company arranged and added $5,000 for this service. It so happened they had an order for farm implements be delivered to New Jersey and included this vehicle in their shipment. Normally, had they applied for an export permit to ship this car out of Germany, it would have been refused. The German government could have claimed ownership of this car. As an information supplement for your site, you might like to know that at the time of researching the car and writing my article on the Brianza-model, I also had spoken to Mr. Frank Barrett of “The Star”, the magazine of the Mercedes-Benz Club of America. He told me a story according to which, when Mr. Barrett ( no relation of his ) of what became later Barrett-Jackson Auctions wanted to kick start his business, he had the so-called Eva Braun Mercedes 540K car built by a coach builder somewhere in California. After being initially on display, (Frank Barrett saw this fake Eva Braun car himself back then), the car disappeared never to be seen again. Has it been scraped quietly, or is it still sitting in one of Barrett’s son’s garages, Mr. Frank Barrett didn’t know. To understand a little better why a genuine 540K no matter in which shape or form would never have been given by A.H. to Eva Braun, one needs only to look at the people involved: no matter what else Hitler may have been, he was a very frugal person, not at all prone to personal excesses, nor to largesses — this was more the specialty of H. Goering, who took advantage of all that his position could provide him with. Finally, I have a letter by Dr. Harry Niemann, the chief of the DaimlerChrysler Archives in Stuttgart, confirming my writings in the MBMC-Journal, debunking the myth, but the problem is summed up in what Frank Barrett, of the “Star” told me: “How do you prove a negative ?”. People want to believe the myth, but be spared the facts. The automobile is valued presently at $250,000. It is the only car of its kind in the world.